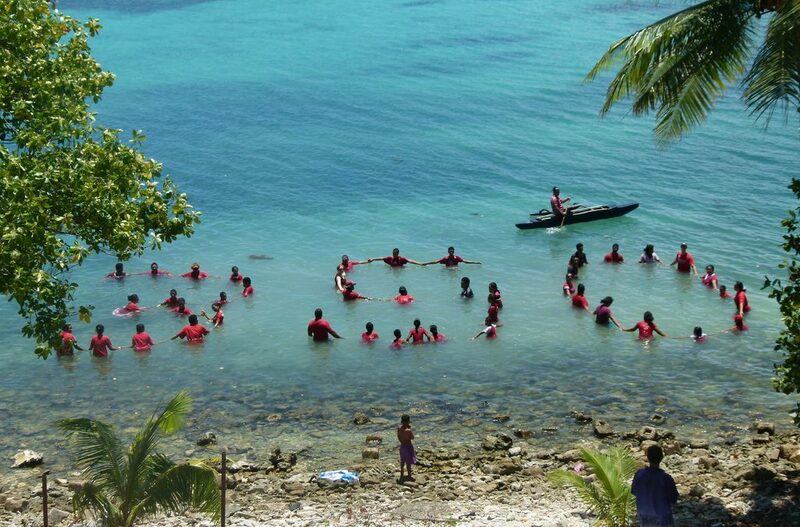 When the Twentieth Conference of Parties to the United Nations Framework Convention on Climate Change (COP20) ended in Lima, Peru in December 2014, the Prime Minister of Tuvalu spoke to the assembled delegates with desperation. The tiny Pacific island loses a few millimetres of ground every year to rising sea water. “I carry a huge burden and responsibility. I carry their hopes that there will be a future for Tuvalu. This is an enormous burden to carry. It keeps me awake at night. No national leader in the history of humanity has ever faced this question. Will we survive or will we disappear under the sea? I ask you all to think what it is like to be in my shoes. Stop and pause for a moment. If you were faced with the threat of the disappearance of your nation, what would you do?”, said Enele Sosene Sopoaga. He called on countries to reduce their greenhouse gas emissions and to increase their ambitions and the levels of financing available to mitigate and adapt to the impacts of climate change, especially in small island developing states (SIDS). Financing is an important component of the extent to which countries are able to effectively adapt to climate change. I’m now working at Brown University in the United States, alongside Dr Matthew Dornan at The Australian National University, to understand the distribution of commitments and the factors that were driving the levels of financing a SIDS receives for adaptation activities. We analysed commitments from Members of the Organisation for Economic Co-operation and Development to 50 SIDS between 2010 and 2014. We also interviewed 65 senior national and regional climate change and finance officials in Caribbean and Pacific SIDS to get their views on this and their access to various financing streams. The findings were contained in a journal article entitled, ”International financing for climate change adaptation in small island developing states” and subsequently summarised in a policy brief, which was positioned to help finance ministers and those responsible for environmental targets to tackle issues in priority order. We found that commitment levels across donors and recipient countries were highly skewed and are likely leaving the most vulnerable SIDS unable to adequately adapt and build resilience to climate change. A few contributed the most: five donors (17%) made 73% of total commitments to SIDS. Australia was a major player, making 48% of all commitments to Pacific SIDS. Four donors (14%) made no commitments at all. Globally, a few got the most: five SIDS (10% of all SIDS considered) received 51% of total commitments. Thirteen SIDS (26%) received no commitments. Regionally, many missed out: 15 Caribbean SIDS (30%) received 41% of total commitments; 15 Pacific SIDS (30%) received 36% of total commitments; and seven Atlantic and Indian Oceans SIDS (14%) received 23% of total commitments. We also found that good governance, larger populations, and lower per capita incomes were strong determinants of the financing levels. However, whether these levels were determined by vulnerability depended on how ‘vulnerability’ is defined and measured – different measures give different results. Overall, SIDS policy-makers were dissatisfied with financing levels and their experience with accessing it. Considering the results, we made two recommendations: donors should consider countries’ vulnerability to the impacts of climate change in their financing decisions, and encourage transparency in the distribution and management of these funds; recipient countries should improve their governance quality as a way of increasing the levels of financing they are able to attract. COP24, which will continue hammering out the finer details of the 2015 Paris Climate Agreement, will be held in Poland in December this year. As the meeting approaches, it is hoped that our findings will be heard and heeded, for the outcome will not just impact Tuvalu and other nations, but the whole of humanity. Study an MSc in Environment, Climate Change and Development. Find out more.